The many species of strong, hardwood oak trees stand out among American natives for their longevity. With over 180 native species of oak trees in the United States alone, there is an oak species for virtually any climate or growing condition. Average life span for most oak species is between 100 to 300 years, though the known maximum life span for several species well exceeds the averages. With good cultural practices, precautions against disease, and the sagacity to know that a newly planted tree will long outlive its caretaker, an oak tree can truly be a legacy for future generations. Knowing where and how to plant a tree can be confusing, especially with a tree that can grow to be over 75 feet tall and wide. 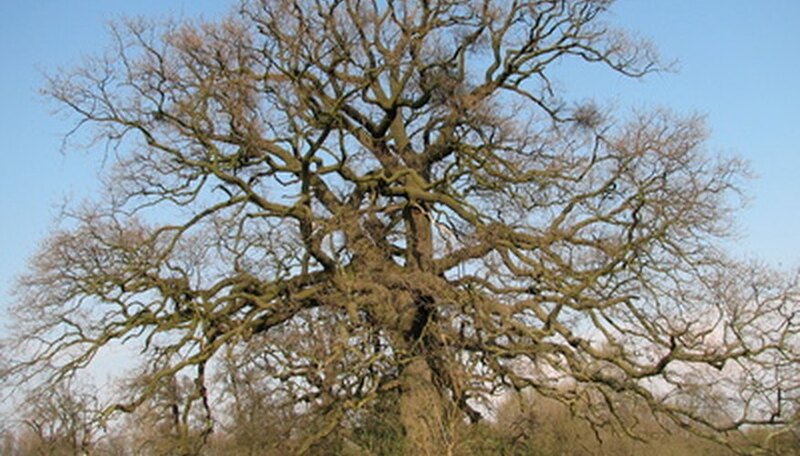 Thoroughly survey the site where an oak tree sapling is to be planted to ensure its future success as a mature tree; considerations for planting should include what is above it, below it, and within mature limbs’ reach. Avoid planting young oak trees beneath power lines or other trees, as these trees will eventually require severe pruning or not reach their full growth potential. Oaks should also be planted at some distance from buildings to avoid run-ins with the roof line or potential damage from storms. Additionally, properly preparing the site where the young tree is to be planted is a critical factor for success. Though established oak trees can withstand periods of drought, occasional flooding, minor attacks by pests, pruning by humans, and browsing by wildlife, young oak trees should have consistent and thoughtful care in the first several years after planting. Maintaining a regular watering schedule through the tree’s first summer will encourage healthy and rapid root growth, though overwatering can actually be detrimental, especially in poorly drained and clay soils. Newly planted trees should generally not be fertilized until after they have become well-established, and a feeding regimen should be determined through soil tests. One of the most common and well-known species of oak, the white oak (Quercus alba), has an average life span of 300 years. Under excellent growing conditions, however, white oaks are known to live up to 600 years, making them one of the longest-lived American oak species. Post oak (Q. stellata) has a maximum life span of 400 years, as do the northern red oak (Q. rubra), chestnut oak (Q. prinus) and overcup oak (Q. lyrata). Many other types of oak trees have known maximum life spans of around 200 years, including the pin oak (Q. palustris), scarlet oak (Q. coccinea) and southern red oak (Q. falcata). While the shorter-lived species may grow at a somewhat faster rate than their longer-lived cousins, all oaks have a slow growth rate compared with many other types of shade tree species. Oak wilt and sudden oak death are two serious maladies affecting even healthy and mature oak trees in the United States, either of which can lead to the demise of an oak tree in a matter of weeks. Oak wilt is prevalent mainly in the eastern half of the country, while sudden oak death has primarily affected trees in the West, particularly California. Oak wilt is caused by a fungus which causes blockages in the tree’s vascular system; death can occur in as little as three weeks after infection. While no cure exists for trees that are already infected, an approved systemic fungicide can be applied every several years by a professional arborist to provide some protection for healthy trees. Sudden oak death is caused by the bacterium Phytophthora ramorum, a naturally occurring pathogen carried by many common plants, including several species of maples, camellias, red tip photinia, pieris, lilac and viburnum. Trees may be infected for several years before showing evidence of infection, including bark cankers, foliar damage, and attacks by pests like bark beetles; after symptoms of infection appear, trees decline rapidly and can die within two to four weeks. Treatment is primarily confined to preventing the spread of the pathogen by removing host plants in close proximity to valued oak specimens, as well as treating healthy trees with a systemic chemical treatment approved especially for Phytophthora.